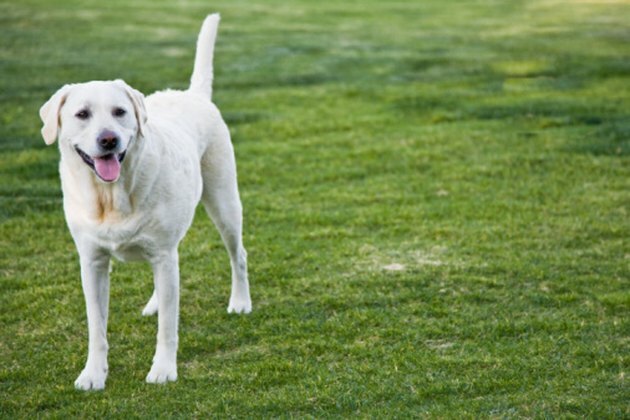 Fleas that make their way onto your lawn will eventually infest your pet. Even if your pet remains outside, the fleas can end up coming into your home by hitchhiking on your shoes or pant legs. Fleas multiply quickly and must be killed as soon as you notice them on your property. It is best to stick with home remedies, as chemical pesticides are unsafe for use around pets and small children. Fleas can be killed with home remedies. Hose down your outdoor pet so that its fur is soaking wet. Lather your pet's fur with dish soap. Once your pet is completely covered, begin timing five minutes. This is how long it takes for the fleas to die. Rinse your pet off, comb out the dead fleas and keep your pet separated from the flea-infested lawn. Sprinkle food-grade diatomaceous earth across your entire lawn. Food-grade diatomaceous earth is safe for pets to eat, but it pierces the exoskeleton of fleas, causing the flea to dehydrate. Fleas die within three days. Mix 4 drops of lavender essential oil and 4 drops of cedarwood essential oil with 8 ounces of water. Spray the mixture on your pet once every couple of days to repel any future fleas.